PHP Scripts Mall Pvt Ltd is a company with 12 years of experience especially in marketing and consulting. We are a Bulk Email Database Service Provider. We provide and dedicate to SMTP with fresh IP for email campaigns. Through our SMTP you can directly send bulk emails simultaneously. We provide reliable delivery, and detailed analysis about how many mails are opened by the customer, how many mails have bounced back, how many have unsubscribed, and spam reports etc. We have lot of features like maintaining online statistics, reports, sending the schedules, managing the contact lists, and email campaign templates, etc. We have a dedicated team to collect email ids from various directories and classifieds. We are here to provide you the database as per your requirement and availability with us. We have a latest updated database and are amongst the top Email Database with SMTP Server Hosting Companies. Our SMTP is white listed, so your emails will be delivered in inbox, the spam delivery depends on your newsletter contents, and database. Due to fresh IP we guarantee you that the maximum number of emails will be delivered in the inbox. 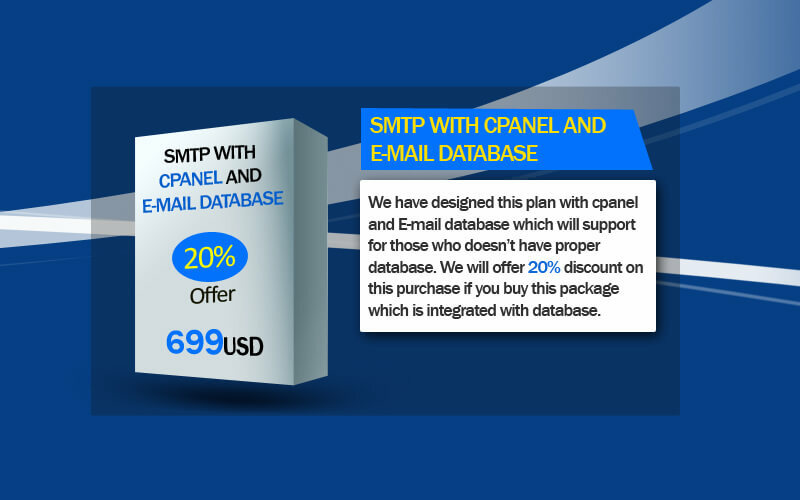 The email database is one-time payment while the SMTP service is monthly payment. I am giving 5 Star for this SMTP Server with email database because it make easy my Email Marketing business and it helped to reach many Customers around the world.